Posted in: St. Louis Blues. 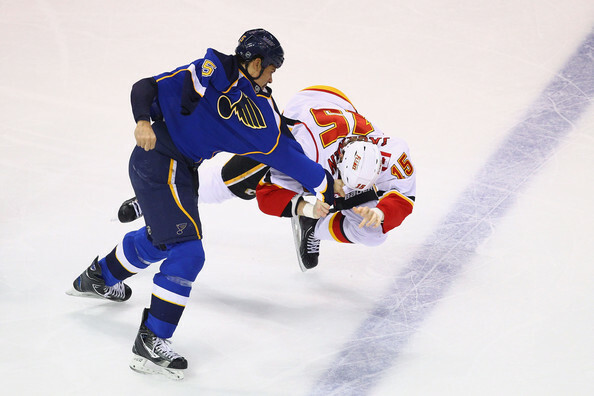 Tagged: Adam Cracknell, Blues, Chris Porter, Cracknell, Jake Allen, Peoria, St. Louis Blues. •This is a different team- This team isn’t the same one that got swept last year. After the 1st period I saw something familiar, the performance last night looked a LOT like last year’s dominating team. But they learned a hard lesson, this team won’t be taking useless minors or have the goal tending fall apart. •The 4th line is playing OUT OF THEIR MINDS- The line of Adam Cracknell, Ryan Reaves and Chris Porter has come out of nowhere. They’ve been playing SO well that Hitchcock kept out Taresanko just to keep this line together. Reeve’s is playing more physical than ever and Cracknell is all over the ice. Every time this line is on the ice, the Blues have the advantage. •Brian Elliot has his confidence back- Brian Elliot is back to his old form. In March who saw this coming? Halak was doing OK and Jake Allen was giving this team a big boost. Elliot was even in Peoria at one point. His timely saves last night were phenomenal. •If the Kings win this series, it will be because of Jonathon Quick– Once again Quick was fantastic last night. The 1st period should have ended 3-0 but Quick kept them in the game. At one point he made a stretching save with the tip of his skate! Absolutely incredible. It’s no surprise this game was so close, it’s going to be a long and very exciting series. Long live the Note!